The secret of successful sleepovers – just leave them to it . . .
SLEEPOVERS didn’t exist when I was a kid. Well, they probably did, but they were a much more informal affair. Back then things were fairly spontaneous. I might stay over at my friend’s house up the road at age 11 or 12, topping and tailing in a single bed, whispering about who was our favourite member of Duran Duran, because it had got late and it was just easier to walk home the next morning. In my teens I often stayed at the homes of my two best friends who lived in town, because I came from a village with one bus a week, my dad worked, and my mum didn’t drive. Sleepovers were born of necessity, not organised social events. At first I always said ‘no.’ While I always liked the idea of having an open house where my kids’ friends came and went like members of an extended family, the reality was different. It’s as much as I can do to keep some semblance of health and safety with four kids and Bloke under the same roof. In short, our house is often a tip. Then there’s the added horror of strangers seeing me shuffling around puffy-eyed in a dressing gown. But when the two eldest got to about age ten the nagging increased. 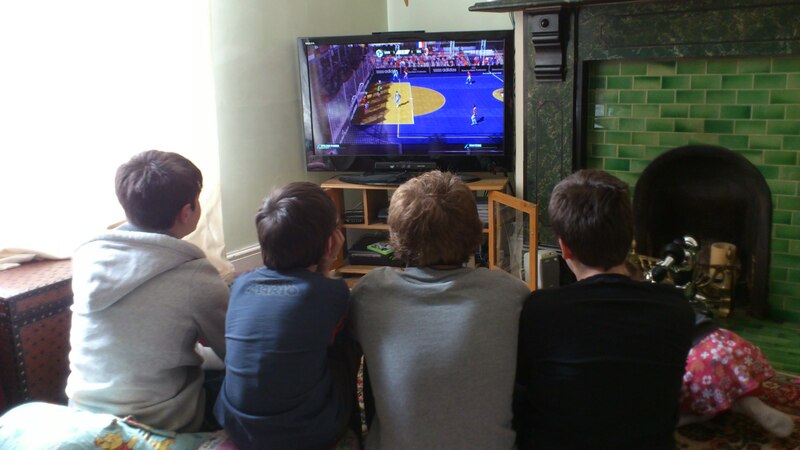 Eventually I made it a birthday event – allowing a couple of boys over for a night so all the kids would watch a video and grind microwave popcorn into the carpets. I’d hastily change all the duvet covers and make up beds on mattresses on the floor. They’d all talk loudly into the night while Bloke and I went up and down the stairs telling them to keep the noise down and go to sleep in a manner than started politely and usually ended crossly. Our boys all share a room so we inevitably had a younger Billy to worry about. These days the ‘sleepovers’ happen more frequently, mostly thanks to the blinkin’ X-Box. They have school friends over to play computer games (even though technology means they can play each other online with headsets to talk to each other from the comfort of their own homes). I’ve given up worrying about what to feed our visitors. Meals are already an ad-hoc affair usually involving huge batches of pasta or oven chips and if they don’t like the vegetables, they can leave them. I can’t threaten them like I do my own children. Poor Billy now gets hoofed out of his bunk to share his sister’s room and we leave the older boys to take over the living room while we watch TV in the kitchen or go to bed early. It’s usually a weekend, they get sent to bed by 11pm, and lie in the next morning. Apart from the occasional check to see they aren’t doing anything they shouldn’t be, we leave them to it. I can only guess how frequently this must happen if you have daughters. At the moment Bonnie is only four, but judging by the horrific tales of hair-dying disasters, nail-polish accidents and tearful fallings-out I hear from friends-with-girls, I’ll be putting off her sleepovers as long as possible.